Where can I park a Gig? Parking with Gig feels like magic, but it actually runs on a series of complex agreements with different municipalities. Members can get parking tickets if they aren’t careful. To ensure the optimal Gig experience here are the various restrictions and allowances for our current service areas. You don’t need to return a Gig to the spot you picked it up from. Just begin and end trips in the Gig's original HomeZone. Sac Gigs can't end a trip in the Bay Area and visa versa. Stopovers outside the HomeZone are permitted, but you are responsible for any parking fees. Parking garages often have spotty cell service. So you might get stranded if you park in a parking garage on a stopover. Bring your Gig card in order to avoid this predicament. There are red zones within the HomeZone, you won’t be able to end your rental there. You can do a “Park and Hold,” just be sure to feed the meter. You can and will be held responsible for tickets or towing up to 12 hours of ending your trip. Just treat the car like it’s your own. You are responsible for parking tickets up to 12 hours after your reservation. When in doubt call Member Care, (800) 464‑0889. You can park in any 2 hour + public, residential permit, or metered space not otherwise restricted, within the HomeZone. We currently have 12 lots in San Francisco and we just opened up a HomeZone in the Richmond District! The private lots each operates a little differently, so view each lot’s hours and restrictions before heading to pick up or drop off a car. Meters are not part of the HomeZone, you have to end your trip in a non-metered spot. These spots are red zoned in the app to help you know where to park. Do not end trips in any spot less than 2-hour parking and double-check the street sweeping schedule. There is designated Gig parking at the Oakland Airport Park ’N Fly lot, at 82 98th Ave, Oakland, CA 94603. Enter the main Park ‘N Fly entrance, take a ticket from the machine, and place it in the cup holder for the next Member. Turn left to park in the reserved Gig parking spaces. End your rental and wait for the Park ’N Fly shuttle to pick you up next to the Gig. To pick up a Gig, locate and reserve your Gig before boarding the Park ’N Fly shuttle. The shuttle picks up passengers from all terminals at the 4E curb. Tell the shuttle driver you’re getting a Gig car and you’ll be dropped off at the Gig section. Proceed to the exit and present the ticket in the cup holder to the cashier to leave the lot. Don't worry, you won't be charged for this ticket. We have designated parking spaces at Ashby, North Berkeley, Rockridge, Lake Merritt, MacArthur, and West Oakland BART stations. If they're all full, you'll have to find another legal curbside place to park off BART property. Some of our San Francisco lots have valets who have training and permission to drive Gigs, other than that you may not use valet parking or let anyone besides you drive the car. 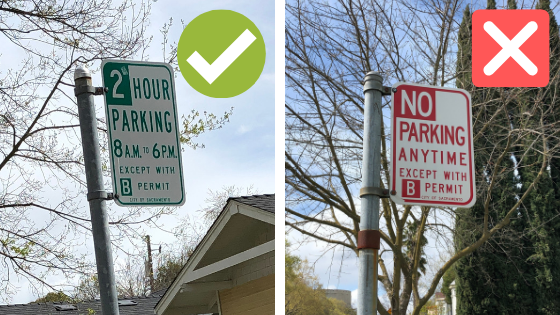 Cars can be parked in any legal space that permits parking for 1 hour or more in the HomeZone, including metered or time zone spaces that allow 1 hour or more parking and are not otherwise restricted. The general rule is if the parking sign is green you're in the clear, if it's red you can't park there. Just be mindful of city services, driveways and no-parking signs. At this time, Sacramento Gigs can't end trips in the Bay Area and vice versa.